Each year, Leyland Exports takes part in raising money for Children in Need by baking cakes, savoury items, holding quizzes and much more but this year we decided to do one element slightly different from past years! 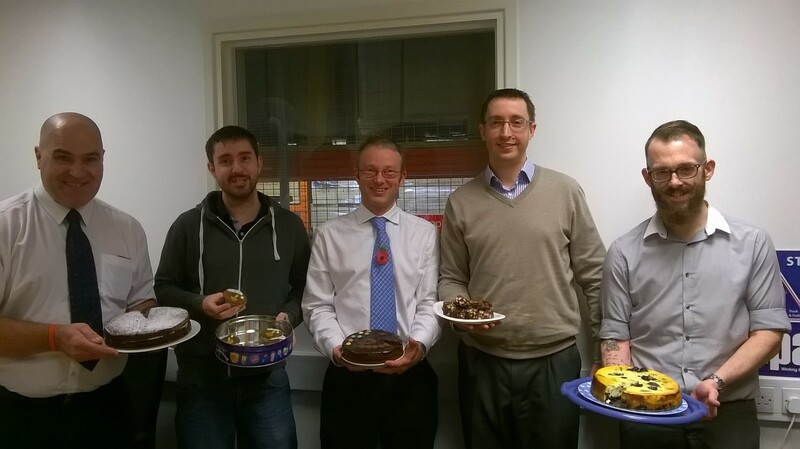 We thought we’d give the men of the office their time to shine by holding a ‘Men Only’ bake-off. With 10 participants, the event was a huge success! From carrot cakes, shortbreads and chocolate cake to oreo cheesecake and rocky roads which all looked and tasted amazing, it was hard to pick a winner! It was all down to the ladies from the office to meticulously judge each and every cake. With blinds down and doors shut, the ‘judging office’ was a no-go zone area for a good half an hour! We’d like to thank everyone who took part and for all your hard work and effort (even though we still think some of you cheated!) We still don’t understand how Nick Gilpin managed to bring his rather large cake in to the office on the back of his motorbike without causing any damage! So far we have all helped to raise £170 towards Children in Need.